If you suffer from the most-enviable predicament of having both too much money and too much wall space, the UK's premiere high-end retail outlet would like to speak with you—something about a 152-inch plasma TV. 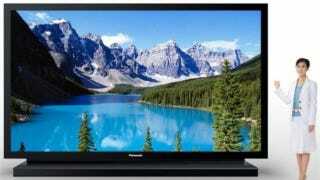 The 152-inch Panasonic TH-152UX1W—the world's largest commercially available flat-screen—is typically used in airports and theme parks for mega-sized displays. It is the equivalent area of a three by three grid of 50-inch sets, weighs 1,200 pounds, and don't even ask how you get it through the front door (pretty sure there's going to be sawing involved).